Best4Video 3D Video Converter transforms any simple video file into a 3D one, effortlessly and fast. Install the application and start converting regular 2D videos to superb 3D movies! The video converter is so fast you will get your output 3D video almost immediately. Simply drag the input simple file and drop it onto the interface of the program, then choose the preferred 3D technique and click CONVERT. The converting starts right away and finishes within a few moments. When the conversion is finished your 3D movie is ready for the playback and enjoyment. Marvelous Best4Video 3D Video Converter makes it possible to convert regular 2D videos to 7 special 3D techniques (3 classic red cyan anaglyph, 2 side-by-side and 2 top-and-bottom). Convert 2D to 3D movies the easiest way for use on your PC or portable device. 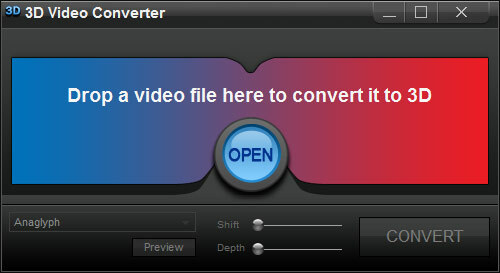 This great video converter supports the following input formats: AVI, MP4, WMV, MKV, FLV, VOB, 3GP, MPG, ASF and many other! The best quality 3D video files converted out of simple videos within a short time span – this is what you get using Best4Video 3D Video Converter. Cool user interface. The program's interface is designed as a pair of red cyan 3D glasses. It's made very easy to use. Superfast conversions. Regular 2D video files of various formats are converted at a turbo speed. All conversions will be finished long before you notice! 7 methods of 3D available. Choose from two side by side, two top and bottom and three anaglyph red cyan 3D techniques to get the desired type of 3D. Brilliant quality. The converter ensures the best output quality of your 3D video. Finest 3D effect. With 3D Depth and 3D Shift you're able to achieve the best 3D effect in your output file possible. 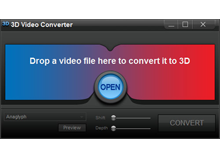 Best4Video 3D Video Converter is the right software for those who want to create 3D video without fancy 3D equipment. Try it and create 3D movie yourself!